The Martha’s Vineyard Museum has entered the home stretch of a major capital campaign to relocate to the former Marine Hospital in Vineyard Haven. The new public phase of the campaign also marks a new direction for the museum under the leadership of Phil Wallis, who took over as executive director this year. 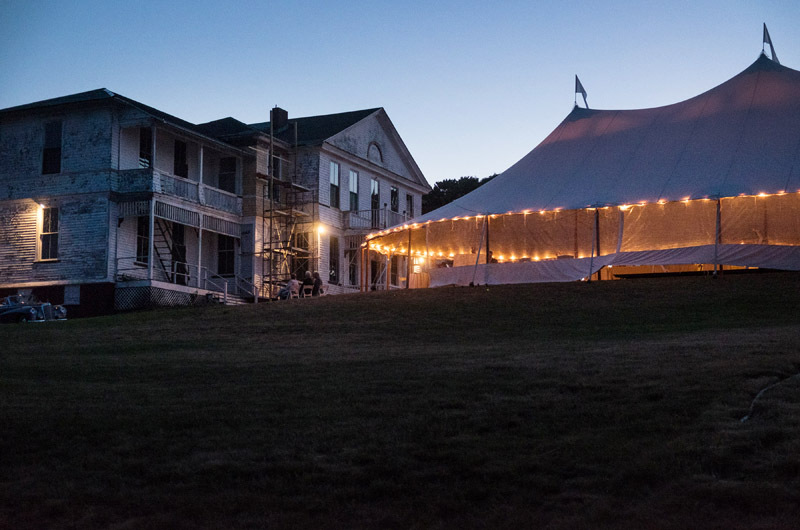 The annual Evening of Discovery gala at the Marine Hospital on Saturday, at which the campaign was officially launched, brought in more than $550,000, adding to the $13 million raised since 2013 when campaigning began in a quiet phase. 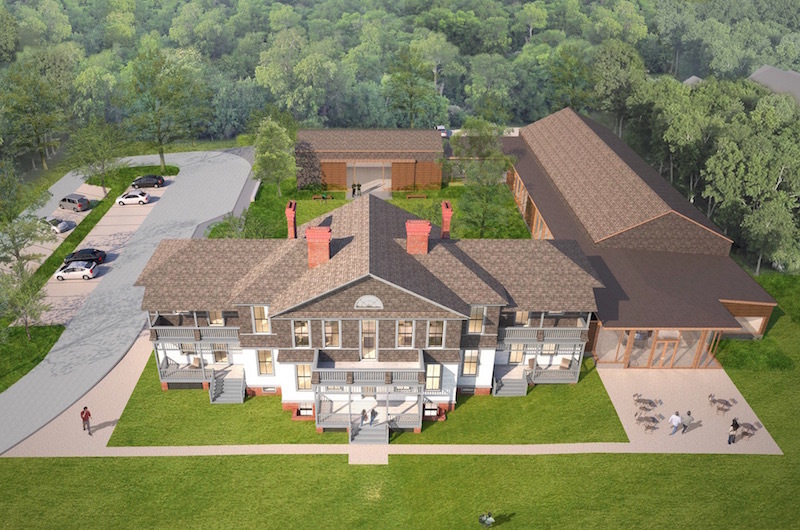 In the next few months, the museum hopes to reach its $18.5 million goal for the first phase of the project, which includes renovating the 1895 Marine Hospital overlooking Lagoon Pond and relocating some of the collection, now housed on a campus in Edgartown. A new mission statement envisions the museum as a cultural hub where anyone can go to learn about the Island and connect to its natural and cultural resources. Mr. Wallis said that the previous mission, to protect and preserve objects for the public, didn’t seem to reflect the transformation already underway with the relocation. In his first 100 days on the job, the former director of Audubon Pennsylvania oversaw a restructuring of the museum’s board of directors, bylaws, code of ethics, human resource manual, staff, brand, logo and mission. “It was an exciting ride that I had no idea I was actually going to be on,” Mr. Wallis said, adding that those changes set the stage for what is already shaping up to be a well-supported public campaign. The bulk of the $18.5 million in the capital campaign will go toward renovating the Marine Hospital building. Another $5.5 million will pay for transitional operating costs and the cost of running the campaign. The museum also hopes to create a $5.5 million endowment, with matching-grant chal lenges by the National Endowment for the Humanities and Roy and Diana Vagelos helping to support educational programming. The gala on Wednesday was a first opportunity to fully unveil the museum’s new mission and image, complete with a new logo that features six polygons arranged in the shape of the Island – each one a different color to represent the six Island towns. The museum has hired Oudens Ello Architects of Boston as the lead architect, and Cvmnext Construction of Philadelphia (a firm that Mr. Wallis has used in the past) to manage the project. Construction could begin as soon as January, Mr. Wallis said, with the new museum opening in early 2018. 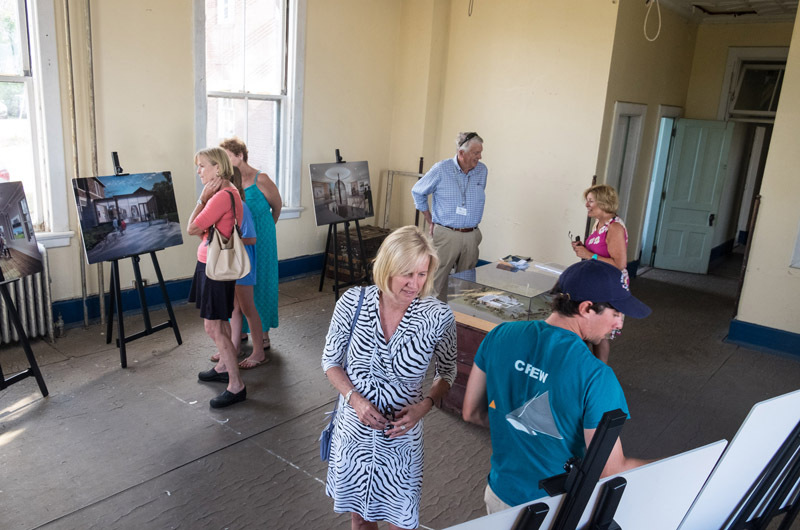 Phase two would require another $10 to 15 million, and see the construction of the new buildings, including one for the early Fresnel lens that once occupied the Gay Head Light and is considered the centerpiece of the collection. That phase could take another three years, Mr. Wallis said, and while he hopes it will happen more quickly, it’s all a matter of funding. “We’ll have all the plans done, but we’re not going to begin until we’ve raised the money,” he said. “That’s our commitment.” Depending on the time frame, a portion of the Edgartown campus may end up providing some revenue through pledge financing, but the museum plans to stay debt-free during the project. 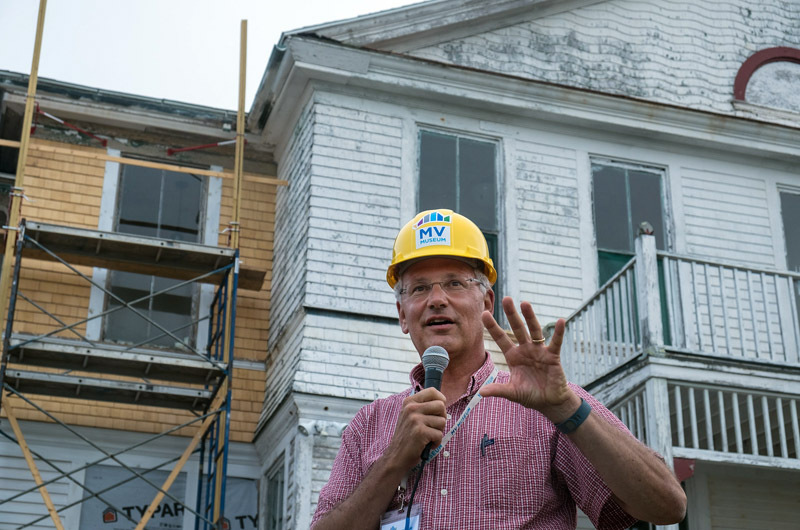 Since Mr. Wallis’s arrival, work has been done on the Edgartown campus, and a recent archaeological survey at the Marine Hospital site revealed stone tools and a trash pit from thousands of years ago. A historical assessment to determine the most appropriate materials for the renovation is now underway. Workers will remove asbestos from the 1895 building this fall, after the last fundraising party of the summer on Sept. 17, and in time for a final Halloween bash. 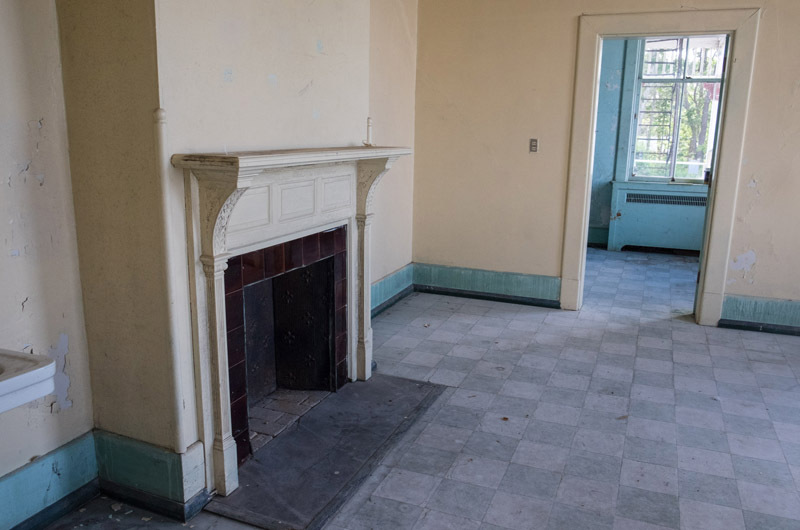 Soon after that, a separate brick building constructed in 1938 will come down, with the bricks and other materials possibly finding other uses on the Island. Mr. Wallis said the later building did not have historical significance and would make it impossible to fully utilize the new site. The remaining $3 million for phase one would be the minimum amount needed to begin restoration in January, but the museum has set an optimal goal of $5.5 million. As with the quiet phase of the campaign, the focus now will be on larger donations, but all donations are welcome. The next big party, at the Captain Flanders Inn on July 13 (sponsored by Ernie Boch Jr.) is aimed at people under 55 and will have a lighter entry fee of $50. All donations go into the same funding pool, although a large number of named gift opportunities are available for donations above a certain amount. A $4 million donation, for example, could put your name on the main building, while a more modest $500 could get you a classroom chair. Four gifts so far have exceeded $1 million, with many more exceeding $100,000 and dozens in the $1,000 to $10,000 range. Mr. Wallis was pleased with the progress so far, but knew that momentum at this phase is critical. The kickoff party this week was a big success, he added, but it was just the beginning. Good news but shall we stop with the name on the building stuff? It is Martha's Vineyard Museum...period.